Initial copies of this release on vinyl had the title Cupid & Psyche 85 embossed in gold print. The catalogue number V 2350 is the same. ℗ 1985 Virgin Records Ltd. This is a super typical 80s' album. On the other hand it's a perfect pop album. Confusing a crossover due to the group's strict political past, there's a lot to shock anyone expecting anything remotely similar to, say, "OPEC-Immac". 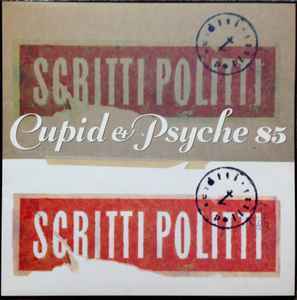 Might be misunderstood these days for the potential care-free cheese factor but revaluing it from a time distance of 30+ years, "Cupid & Psyche 85" remains a great testament to ambition and hard work that payed off in its 40-something minutes. A completely new line-up at the time - Green, Fred Maher and David Gamson delivered a record with a pedigree, keeping some of the subversiveness mainly in the album's cover art (the rear side is a reference to Marcel Duchamp). On the music side of things, the highlights are definitely the five principal singles - "The Word Girl", "Absolute", "Wood Beez (Pray Like Aretha Franklin)", "Perfect Way" and "Hypnotize" - the latter's bonus dub mix on CD/cassette is superb and the closest Scritti got to a certain Mark Stewart & the Maffia. The remaining songs consistently add to the cute playlist but as a whole "C+P85" may be a bit too sweet to handle. Of course this doesn't undermine the charm and the intention to make one feel good. And who doesn't want the taste of the finest milk chocolate constantly melting in the mouth?